International Surf WQS planned at Arugam Bay this June! With the growing success of the Surfing Federation of Sri Lanka (SFSL), it will host the World’s most accomplished Surfers in a World Qualifying Series (WQS) competition this June at Arugam Bay. The SFSL is a member of the National Olympic Committee of Sri Lanka and will play a big part in the proceedings. Altogether, 145 competitors and 105 officials from 22 countries such as United States, Brazil, South Africa, Australia, New Zealand, Portugal, France, Japan and Indonesia, to name a few. are billed to participate, with the projected income for Sri Lanka set at US$ 450,000. The World Surf League (WSL) is the home of professional Surfing, and the WQS events are given Star Ratings with this particular event made a 6 Star Event, the highest rating in this series, up with the Hawaiian events and attracting the very best of professional Surfers. In the exciting world of professional Surfing no one is safe on the “tour” and attendance and good results at these events, held worldwide, are vital in keeping the dreams alive of a possible world title one day. The WQS is the only possible route into the final Championship Tour that decides a world champion from 32 Surfers, but those in the lower rankings of the Championship Tour have to compete in the WQS events to stay on that tour, so expect to see some of the biggest names in Surfing gracing our waves. The global media presence at the WSL events is massive with an expected 120 million online viewers over an event window. This media exposure would be a huge boost to, not only Arugam Bay and Eastern Sri Lanka, but to the entire Sri Lankan tourism sector. Sri Lanka would be up in the rankings of Hawaii, California and Australia who of course are major venues for WSL events. WSL events are expect to bring around US$ 450,000 of direct revenue to the area where the competitions are held, but it’s the aftermath of this exposure online that has made a huge and positive impact for many countries that have hosted these events. So how do they find a winner? Surfers are judged by a panel of 5 professional judges who travel the tour and the Surfer will be judged according to a set criteria, with each wave judged out of a possible maximum 10 in a 20-30 minute period. Of course, they are surfing against their rivals but more than that, they are trying to catch the judges eyes with a solid performance. Its exciting stuff and quite easy to understand. Even the layman can often give a solid opinion on a spectacular surfing display. Surfers compete against one another in groups of 4 until the final exciting rounds where its man-on-man competition until the winner is crowned. They receive considerable prize money too for their efforts. 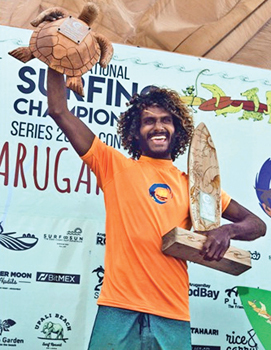 Lesitha Prabath was crowned national surfing champion of Sri Lanka in Arugam Bay after two days of battling his rivals at the inaugural National Surfing Championship Series 2018. The local 27 year-old from the Arugam Bay Surf Club had to overcome windy conditions and head high sets of waves but convinced the judges by showcasing strong skills of speed, power, flow and a solid aerial. An aerial means the surfer flies through the air above the wave to land again and carry on the ride. This gave him the leading points above his fellow competitors Praneeth Sadaruwan (2nd place) Asanka Sanjeewa (3rd place) and Nadeen Sampath (4th place). Tim Jones, International Surfing Association advisor to the SFSL commented on the outstanding skills of the new national champion: a? ?Lesitha probably is the most experienced when it comes to contests. He has got solid, strong skills. He is also one of the few competitors that has an air game. In the finals, his understanding of being safe in his surfing when he needed to and taking chances and risks in his surfing when it demanded he did so, was excellent.a?? The three round championship was organized by the recently formed Surfing Federation of Sri Lanka. In January 2018, Lesitha had already applied his winning formula at the start of the popular series in Hikkaduwa. Although Lesitha only made it into the semi-finals at the second competition in Kabalana in March, he pushed hard to succeed at his home-break. For Lesitha it was a special moment in his life and a historical one for the whole nation. a? 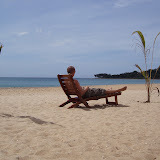 ?Of course it was my dream to become the National Surfing Champion of Sri Lanka. I trained for it. Whenever I had free time I came to Main Point.a?? Hiran Ukwatte, first president of the SFSL explained: a? ?Surfing as a sport has only very recently been introduced by the International Olympic Committee to the Olympic Games. It will feature in the 2020 Olympic Games in Japan. a? ?In Sri Lanka, surfing was only considered a tourism development activity, enough to get the tourists to visit the country. But when this Olympic moment came it laid the ground to have a National level event for the first time in history.a?? From Arugam Bay with its legions of thunderous marching waves to the enchantingly golden seas and beaches along the southern coastline, surfing in Sri Lanka has seen a sizable structural shift. From existing entirely as a healthy pastime and tourism tool, in recent years it has thrown on a thicker cloak of sporting legitimacy, stitched together by a collection of passionate practitioners and benevolent organizers of surfing projects and competitions. Last week saw the beginning of one such helpful competition, Red Bull Ride My Wave, a unique local surfing tournament which matches up surfers from the countrya? ?s two renowned hubs for the sport, the eastern and southern coasts. 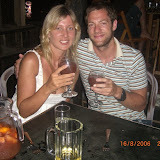 By doing this the competition aims to discover the islanda? ?s best surfers, foster friendly rivalry and promote and develop the sport. The competition is being staged in a two-leg format, with the opening round in the south coast ending on March 15 before action resumes in Arugam Bay from August 5-7. Surfing on unfamiliar waters, the men from the east nevertheless managed to pull off an upset, spearheaded by Asanka, a name synonymous with the sport locally. Asankaa? ?s imaginative over-water artillery outgunned anything anyone else could pull out of their arsenal and helped him ride away with the opening lega? ?s top surfer title. a? ?I am delighted with the result. It is a reflection of the hard work of each surfer. It was an honour to captain this team,a?? Asanka revealed. Every night there will be a variety of local Entertainment. Food stalls, licensed bars, live music events and more. All (well behaved) men also! What is the generic name for proscar COOLANGATTA, Queensland/Australia (Thursday, 12 January, 2012) a?? For the last 2 year ASP Australasia have been involved in the running of one of the most exotic events on the ASP calendar a?? The SriLankan Airlines Pro. If youa? ?ve been wondering which location to select for your next surfing safari, make sure you check out these videos and consider making Sri Lankaa? ?s many long right-handed point breaks your destination. Trips abroad are always a tasty side-dish to the long hours on the sand that are most surf photographera? ?s meat-and-potatoes, but when Duncan Macfarlane got the call from 18seconds Magazine earlier this year to jump on the next plane to Sri Lanka he knew he was in for a particularly spicy assignment. Several weeks later he was back, reeking of curry, with a hard-drive full if images, a beard full roti crumbs and head full of stories about mindless right-handers. The chefa? ?s special on Sri Lankaa? ?s menu-board of uncrowded points is Arugam Bay. Arugam Point is the main wave in the area and generally the most crowded. An average wave breaks for about 100 metres, but if you find a pearler you could ride for 300 metres or more. The wind is always best in the morning before the trades come up around 10-11am. The point can handle plenty of swell up to eight-foot. Some 300 metres in from the Point is Inside Point. It doesna? ?t connect with the outside section, so dona? ?t get too exited. On an average day this wave is a fun, gentle break for beginners learning to surf, but ita? ?s wedgy and out of the wind. Aldara annual sales A A?good, remarkable video clip. In perfect quality, with super clear images. TheA?’Sri Lankan Pro’-surfing contestA?commenced in the Purchase avalide 300 Arugambay coastal belt today.A?A?This is the largest Beach Pageant held in the Indian Ocean Region. More than 100 foreigners areA?set to takeA?part in the contest. Surfers from several countries will participateA? in the ‘Sri Lankan Pro’ contest which will be held until next Sunday. A large number of locals too have gathered for the function with several other attractions in the area. Among them are the Magul Maha Viharaya, Muhudu Maha Viharaya, Kudumbigala Forest Sanctuary, Bird Sanctuary and Crocodile Rock. How are you i am doing well here. The happy news i like to inform you our surf club have been registered under the sports ministry of Sri Lanka. This is the register number 142018. I feel my big responsibility reached the moment.i try since 2006 but yesterday reached. i hope from this year we can do better works.